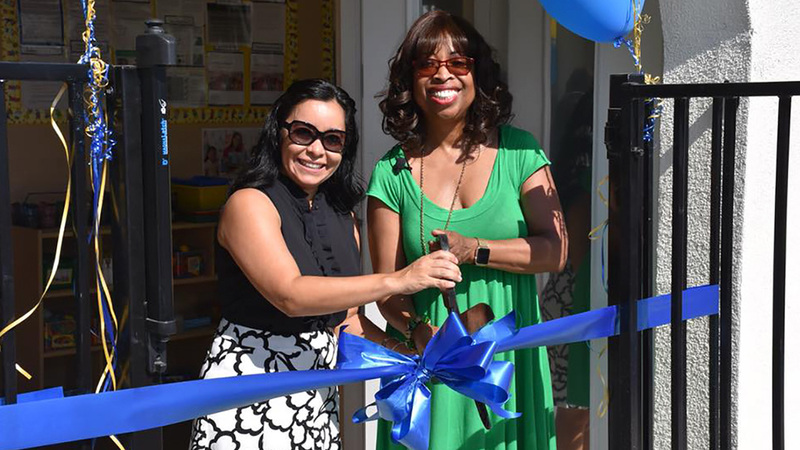 Members of the community joined the San Bernardino County Preschool Services Department as they celebrated the Grand Opening of the Valencia Head Start Center in Redlands on Friday. The celebration included a tour of the facility and a chance to meet the teachers in addition to refreshments, activities, and music. President Lyndon Johnson established the Head Start program more than fifty years ago to help break the cycle of poverty by providing preschool children of low-income families with a comprehensive program designed to help meet their emotional, social, health, nutritional and psychological needs. The Head Start preschool classes are free to qualifying families. In addition to school readiness, the Head Start program includes nutrition, health, mental health and disability programs. In addition, the program offers several programs for parents including a job training apprenticeship program that can lead to employment opportunities and an online high school diploma program for those who did not complete high school. In addition to the new Redlands site, Preschool Services has Head Start locations throughout San Bernardino County and are enrolling for the 2018-19 school year. Contact the Preschool Services at (888) KIDS-025 for more information and access applications online at http://hs.sbcounty.gov/psd/. Head Start Centers are also located throughout Riverside County. To learn more visit http://www.rcoe.us/children-family-services/head-start-early-head-start-programs/head-start-and-early-head-start/faq/.